Here is a sampling of home dec projects I’ve made over the years. Left click on an image to see a larger view. I wish I could say the master bedroom in question is mine but in fact these shams are in my twin sister Diane’s home in Atlanta, Georgia. I made them during my annual Thanksgiving trip using a lovely paisley decorator fabric she bought for a mere $2 a yard shortly before the home decor fabric shop closed. Diane designed the shams and I figured out how to make them. Click here to see the process from concept to execution. 2017. While at my sister’s home in Atlanta over my annual Thanksgiving visit, I made this tablecloth for her dining room table using a large floral fabric and a small scale fleur de lis print. The mitered border was designed to go all the way around on the wrong side and cover the seams where the two fabrics were joined on the front. Click here to read about the making of the tablecloth. 2015. The slipcover I made in 2010 for my sister’s ottoman (see Slipcover #1, below) turned out so well that I made another one for a second ottoman during my Thanksgiving visit in 2014. This one was easier to make because I had a similar one to use as a pattern. It was necessary to fuse interfacing to the back of the decorator fabric to give it enough body. To read about the making of this slipcover, click on this link. 2014. Over Thanksgiving 2013, spent at my twin sister Diane’s home in Atlanta, I made a valance and side panels for her loft using recycled panels from our sister Reigh’s home. To read more about the project, view my post here. 2013. New Valances for My Sister’s Guest Room . . . The guest room in my twin sister Diane’s home in Georgia got a major home dec facelift during my visit over Thanksgiving. I fashioned a pair of valances based on Diane’s own design and made a new bedskirt out of the same decorator fabric. 2012. To read my post about these projects, click here. My sister Reigh ordered a valance from a catalog and was disappointed in both color and quality when it arrived. We found this wonderful blue and yellow home decorating fabric at our local Mill End store, and I made a valance based on the store-bought version. When Reigh moved to a new home, the valance went with her, and on one of my visits I was able to alter it to fit the new window. 2007. When my sister Diane renovated her second guest bathroom, she brought in a shower curtain I had made for another bathroom. The ceiling in the renovated bathroom is much higher than the other one, so the shower curtain was way too short. Fortunately, we were able to find more of the same Waverly fabric I had used in the original version. I simply added a wide piece of horizontally striped fabric to the bottom to complement the vertical stripe at the top. On a visit later the same year, we added the ball fringe. Click here to read more about it. 2012. I’m not a fan of slipcovers. What I like about this one is that it doesn’t look much like a slipcover. It covers an upholstered ottoman in one of the guest rooms in my sister Diane’s home. 2010. 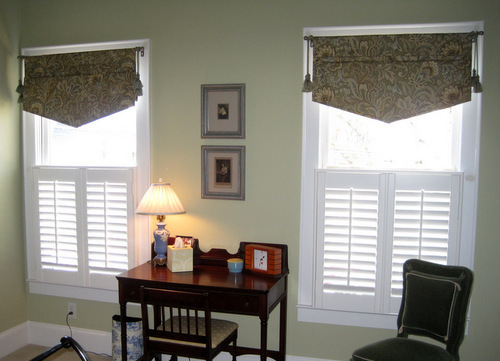 This valance with inverted pleats was made for my sister Reigh’s master bath. The tabs are grosgrain ribbon. 2010. For my sister Reigh’s guest bath, I embellished a store-bought shower curtain with set-in circles made from a variety of textured home dec fabrics. 2010. My sister Reigh and I collaborated on the design of these pillow shams for her guest room. They are coordinated with a tailored bedskirt and tab curtains. 2006. I also made the pleated bedskirt. 2007.